As much as Worm thinks that his mother and I are each carrying a baby in our bellies, he will see only one infant arriving here shortly. And even though I may not be delivering a child, it is my fatherly duty to read and learn something about pregnancy, if only to help me cope with my sympathy pains. Since I’ve only got a couple of weeks before Smush shows up, I thought I’d dust off the old books from our shelf and brush up on how to have a baby again. I’ve got one word for this book – polarizing. I liked the book up until the section on fathers. I almost burned it after that. The authors, Pam England and Rob Horowitz, give an, ahem, interesting perspective on childbirthing. The title says it all, the extra-ordinary guide to childbirth preparation. (For U.S. readers, this book will be considered extra-extra-ordinary.) 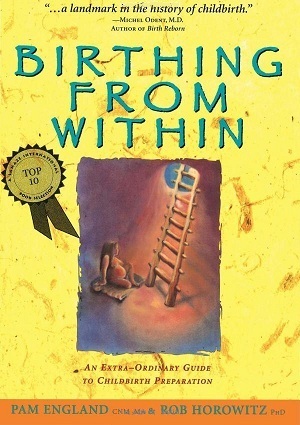 Birthing From Within (BFW) is not for everyone. The litmus test should be the first two reading sections …if you can get through those 75 pages without scratching your head, staring blankly at your privates, or thinking “WTF?”, this book may bring out the repressed version of yourself and cause you to take a closer look. I enjoy self-help books. I really do. BFW definitely falls into that category. It gives tips and ideas to help a mother-to-be face her fears and learn to accept herself and her state of maternity. It also tries to empower the pregnant mother by emphasizing that she take a more active role in the whole process. These are very good things. Though, the book soured as I flipped further through the pages. Chapter after chapter, the midwives are glorified and everyone else belittled. I started the book fairly excited about the art therapy section and exploration of the subconscious mind through drawing or sculpting. It was the repeated horror stories and badgering of the medical professionals that was undesirable. The wife and I have had this book since before Worm was born. Did we read it then? Nope. We perused a few pages and were lost in the strange ideas that were being presented. We felt that Birthing From Within wasn’t what we needed for our first birth. For our first birth, we wanted details. We felt that birthing in America required some knowledge of drugs and medical equipment. We wanted to know all the technical details along with any surgical and non-surgical procedures that the hospital would possibly use on us. Understanding our environment was of utmost importance. Therefore, we felt that this book was not quite what we needed. Do I feel like we need this book now for our second birth? Some chapters resonate with us now that we have a little more experience. Steph and I both know a little more about what we are looking for and what to expect. Having some experience also allows us to weed out the things from BFW that we don’t believe to be valid anymore. (Some of the data is 20 years old.) Should the birthing experience value the mother as much as the baby? Yes. We agree with England and Horowitz. Should the husband be a wallflower during the birth? No, we vehemently disagree. Are there doctors and nurses out there that will continue to push drugs and medical procedures upon a laboring mother? Yes, but not all of them are interested in intervening during labor. Are midwives helpful during labor and delivery? Yes! But, so are husbands, fathers, doctors, nurses, doulas, friends, and family. The birth experience should involve those people that support the mother and give her strength without taking away from her focus. Period. Birthing From Within is a one-sided view of what a woman’s birth experience should be like and what players should be involved. Some of the ideas are great, but others may not be as helpful. But as there are many women in the world, so too are there books on the ‘right’ way to birth. This book will agree with some women, but it’s strong stance makes it somewhat biased and will turn many women (and couples) off. Pros: Tries to engage mothers to take an active role in their birth experience. Works on bringing up subconscious issues about pregnancy and birth to the mother’s awareness before labor and delivery to remove any mental and emotional roadblocks that may hinder birth. Takes a more spiritual approach rather than a technical approach to childbirth. The section “Birthing Through Pain” is excellent. Cons: This book is mainly focused on using art to address underlying concerns about birthing. Lots of negative experiences are used in the book as examples. There’s a negative tone about men “helping” in the delivery room. It paints a picture that men should only pat their wife’s head and whisper reassurances about how well she is doing…and that more than that will probably hinder the birthing experience. There is a lot of bashing in this book of Western medical professionals as well. (I admit that I experienced quite a few of the bad things that hospitals add to the birth process, but some of my friends have had great experiences with doctors and nurses.) It is a very opinionated book and some of the data presented has since changed. Things I would modify: Add more recent birthing data. Add more positive birth stories. Reflect multiple birth stories from various points of view. Respect that fathers (and husbands) are sometimes a mother’s most intimate confidant and that they may be willing to fully submerge themselves in the birth experience, rather than being there just to hold back mother’s hair in the delivery room.